CULLOWHEE, N.C. - Charleston Southern split on the final day of the Catamount Classic hosted by Western Carolina University in the Ramsey Center. CSU fell in straight sets in the opening match of the day on Saturday, before rallying back to sweep Robert Morris in the afternoon match. The Bucs finished 2-1 over the weekend, hitting .252 as a team over the three matches. Madison Malloch paced the offense averaging 3.33 kills per set and a .400 hitting percentage, while Madison Martin averaged 5.67 digs per set over the two days. Charleston Southern kept it close in all three sets, but the Buccaneers were unable to make a late surge in falling to the host Catamounts in the first match on Saturday afternoon. Macey LaPorte (12) and Madison Malloch (12) combined for 24 kills in the three set match as the Buccaneers (1-1) hit .248 as a team from the floor. LaPorte added three digs and a block assists, while Malloch hit .440 from the floor to pace CSU's offensive efforts. Naiomi Rivera added 33 assists and 10 digs, while Madison Martin and Hannah Western had 16 digs apiece in the losing effort. Abigail Veit paced Western Carolina's offense with 14 kills, while MaKenzie White added 12 as the Catamounts picked up their second win of the season. Hannah Price added 35 assists, while Merry Gebel had a team-high 17 digs in the victory. CSU continually chipped away at the Western Carolina lead in the first set before the Catamounts utilized a late four-point run to build a 24-17 lead. The Buccaneers battled back behind back-to-back kills by Malloch and LaPorte before White placed in the final kill for WCU. Malloch and LaPorte continued to swing well in the second set as the duo recorded six kills apiece in the second set as the Bucs hit .364 in the frame. CSU and Western Carolina battled through 10 ties and three lead changes. The Catamounts took advantage of a late Veit kill to break a 22-22 tie and White sandwiched a LaPorte kill with a pair of her own to give WCU the 2-0 lead. WCU came out the break strong and built an 18-10 lead behind six Veit kills. CSU slowly started their comeback with LaPorte starting a 10-4 run with a kill. Skylar Blackmon, Rachel Smith, and Rivera all added aces during the stretch as the Bucs cut the lead down to 22-20. Malloch and LaPorte again went back-to-back with kills to put the score at 23-22 late, but a WCU timeout refocused the Catamounts as they took the final two points to secure the win. Madison Malloch's 12-kill performance was her first double-digit kill game in her CSU career. Macey LaPorte's 12-kill performance was also the first double-digit kill game in her CSU career. The Bucs hit. 248 as a team in the match, including a team-best .364 overall in the second set. Rachel Smith paced the Bucs with a pair of service aces and added seven digs. Madison Martin is 15 digs away from 1,500 for her career following her 16-dig game against the Catamounts. Addison Kaderli surpassed 900 career kills in the first game on Saturday, becoming just the seventh player in CSU history to reach the career mark. 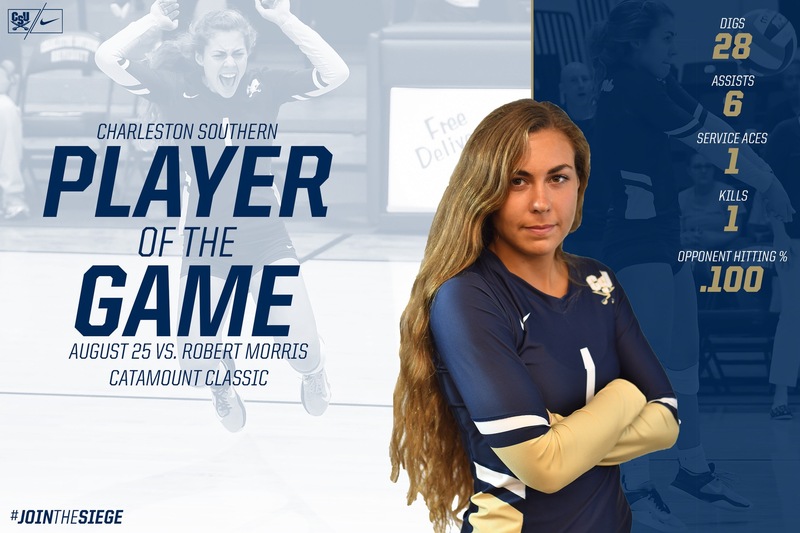 Charleston Southern utilized standout performances from Madison Malloch, Naiomi Rivera, and Madison Martin to cruise past Robert Morris in their final match of the Catamount Classic. The Bucs (3-0) never trailed in either of the final two sets on their way to recording their second sweep of the weekend. Malloch led the offensive efforts with 11 kills and a .348 hitting percentage, while Macey LaPorte was also in double-digits with 11 kills. Rivera recorded the double-double with 29 assists and 14 digs. Madison Martin added a team-best 28 digs in the win. Emma Granger led RMU's (0-3) offense on the afternoon with 11 kills in the match as the Colonials struggled to connect against the Bucs. Robert Morris hit .100 as a team in the loss and finished the weekend winless over their three matches. Robert Morris took a commanding 16-9 lead in the first set following an Alyson Londot kill as the Colonials utilized an 8-1 run early in the frame. The Buccaneers steadily chipped the lead away behind Macey LaPorte's five first set kills to pull within striking distance at 20-18. Following a pair of Granger kills, Addison Kaderli, Hannah Western, LaPorte (twice) and Rivera all connected on points for the Bucs to swing the lead back to CSU. Rachel Smith added a service ace before LaPorte's final kill clinched the 25-23 set win for CSU. After early jostling in the second set, CSU took advantage of a trio of RMU errors and a Rivera kill to take an 18-12 lead. The Bucs cruised the rest of the frame with Malloch adding a trio of kills and Ashleigh Holweger chipping in a service ace in taking the 25-18 set win and 2-0 lead. The Bucs never trailed in the deciding frame with CSU's lead reaching double-digits for the first time at 19-9 on Martin's lone service ace of the match. CSU scored six of the last eight points with Kaderli and Caroline Demuth combining for a block to highlight the Bucs' run to close out the match. Madison Malloch made it back-to-back matches with double-digit kills following her 11-kill game against the Colonials. Right there with her, Macey LaPorte added 11 kills of her own to go with three digs for her second straight match with double-digit kills. The Bucs hit a team-best .275 from the floor in the third set and limited RMU to a .000 hitting percentage in the frame in securing the win. Caroline Demuth made her CSU debut in the match with the freshman middle blocker contributing two block assists in the third set. Skylar Blackmon recorded her first double-digit dig match of the season with 15 against the Colonials. Madison Martin became just the fourth CSU player in program history to reach 1,500 career digs when she went over the mark midway through the second set. Martin finished the match with 1,513 career digs and sits just 22 behind CSU Hall of Famer Amanda Hill (1,535 - 2007-10) for third all-time. The Bucs finished the opening weekend with a winning record for the first time since the 2003 season when CSU won its first seven matches of the year. Charleston Southern returns to the Buccaneer Field House on Tuesday evening as CSU hosts Savannah State in the Bucs' 2018 home opener. First serve between CSU and the Lady Tigers is set for 6 p.m. and will be streamed live via ESPN+.